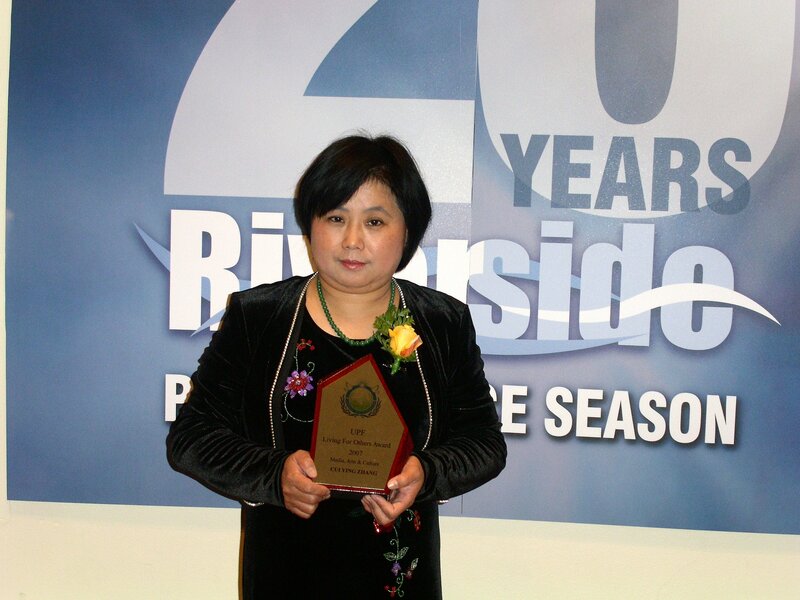 (Clearwisdom.net) Falun Dafa practitioner and Chinese artist Ms. Zhang Cuiying, the plaintiff in an Australian lawsuit against former Chinese dictator Jiang Zemin, received the "Living for Others Award," issued by the Universal Peace Federation at Riverside Theatre in Sydney on October 27, 2007. The Universal Peace Federation is a global organization which encourages and promotes community peace, living for others, and helping to eliminate religious, racial, and national barriers. The Living for Others Award is an annual prize given to people who have made sacrifices for others, and who eagerly serve others. The Universal Peace Federation is also a special negotiating organization of the UN Economic and Social Commission. 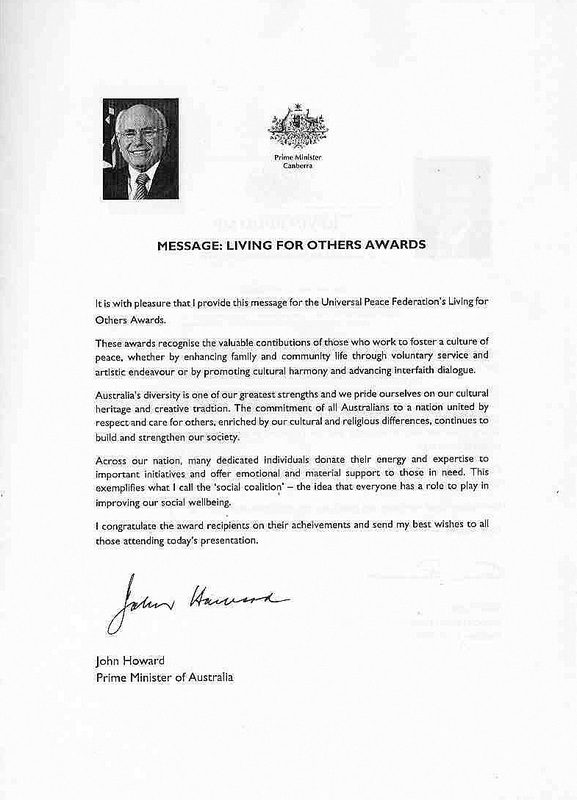 Australian Prime Minister John Howard sent a letter of congratulations to all prize-winners. The Prime Minister wrote, "Australia's diversity is one of our greatest strengths and we pride ourselves on our cultural heritage and creative tradition. The commitment of all Australians to a nation united by respect and care for others, enriched by our cultural and religious differences, continues to build and strengthen our society." "Ms. Zhang Cuiying was born in 1962 in Shanghai, China. She loved painting ever since she was a child. [....] Zhang is now a world-renowned Chinese artist, having successfully held art exhibitions in over 40 countries around the world. 1n 1996, Zhang was stricken with rheumatic arthritis, with pain so severe she could not lift a paintbrush. At that time she was introduced to an exercise system to improve and purify the mind known as Falun Dafa. Her arthritis soon disappeared, and Falun Dafa became a part of her life. "In 1999, she was imprisoned by the Chinese government who had banned the practice of Falun Dafa, and tortured for 8 months, until her release in 2000. Through her collection of paintings, as well as her life experiences, she continues to raise awareness of human rights abuses in her birth country of China, as well as helping out locally in times of crisis. In January 2002 she raised $3000 for the NSW [New South Wales] bushfire appeal through the exhibition and sale of her artwork. 'Truthfulness, Compassion, and Forbearance' through her art and her life. She is an inspiration to all of a peaceful and caring person." Because of Zhang Cuiying's belief in Falun Gong and her appeal for the CCP (Chinese Communist Party) to stop the persecution of Falun Gong, she was detained and tortured for eight months in 1999. Furthermore, Ms. Zhang's nephew Chen Zhongsheng was sentenced to three years of forced labor in 2000, because he also firmly believes in Falun Dafa. He was subjected to torture, and was once tied to a death bed for over ten days. In April 2006, Chen Zhongsheng was again arrested and was sentenced to two years of forced labor. In order to stop the CCP from sustaining the inhuman persecution of Falun Dafa practitioners, Ms. Zhang submitted a lawsuit against the prime criminals of the persecution: Jiang Zemin, Luo Gan, and the 610 Office, at NSW Supreme Court on September 15, 2004. The case has made progress recently. Ms. Zhang said that the Supreme Court wrote to her on September 3, 2007, "Service of petition was completed on July 24, 2007, according to provision 24 of 1985 foreign immunity." Moreover, the notice by the Supreme Court to defendant Jiang Zemin stated that if he fails to respond within two months, he will have violated the regulations, the court may not give him any more notice, and he will be brought to trial. Ms. Zhang hopes Prime Minister John Howard pays attention to her nephew's plight and all detained Falun Dafa practitioners' safety, together with leaders in other countries, and helps end this human catastrophe.